Woohoo! It’s crispy tofu curry noodle time! I love this recipe! So does Christopher! I love, love, love curry. I have brought Christopher along for the ride. And I never thought I’d hear him say that he enjoys curry, but he does. I’m so proud of him! What is not to love? Seriously? 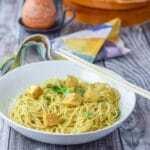 Noodles with a nice slightly spicy curry and some crispy tofu? Crispy tofu is my favorite way to eat tofu. And the way I make it, it’s crispy, yet soft in the middle without being deep fried. My second favorite way to eat tofu is to marinate it in soy sauce and maple syrup. When Christopher and I were vegetarians, we use to eat tofu like that a lot. It got to the point, that I couldn’t get excited about eating it. But I have since recovered and am back to eating tofu again periodically. 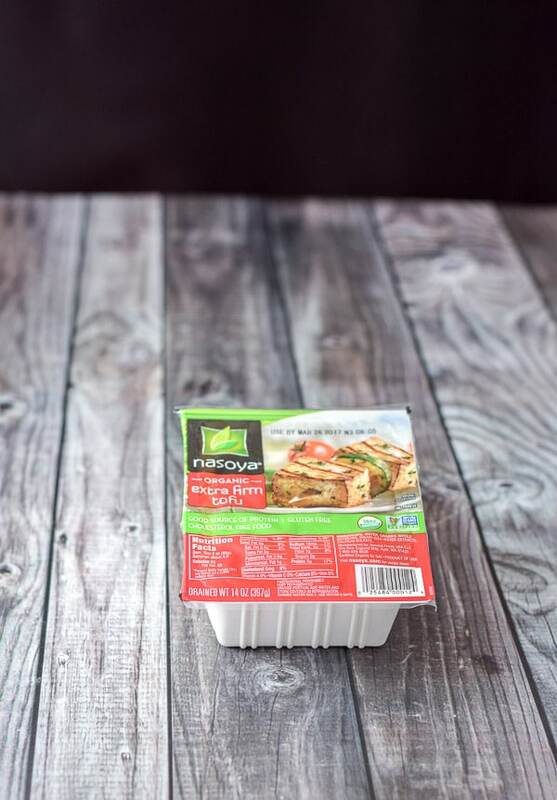 What’s your favorite way to eat tofu? Leave me a comment to let me know. I wanted to take a photo of tofu by itself since it’s the star of the show. The first thing I do, is open the tofu package, drain it and get ready to get as much water out of it as I can. 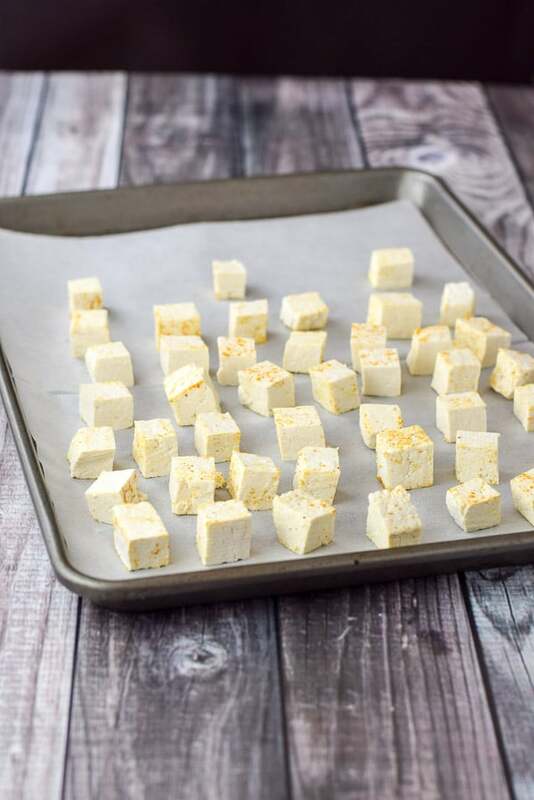 That’s the trick to making crispy tofu without deep frying it. I wrap the drained tofu in a clean dishtowel and place it on a plate. Then I take another plate, put it on top of the tofu and carefully balance my heavy cast iron wok on top. The following photo shows the water already leaking out. 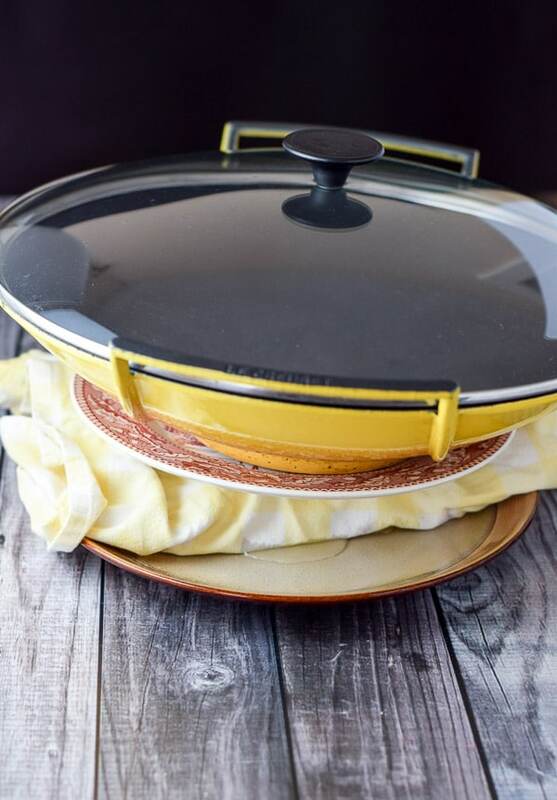 Now, you don’t need this wok (you do really because it’s a heavenly cooking vessel), you just need something really heavy so it will force the water out. I let the wok do its job for at least 30 minutes. While I’m waiting, I gather the ingredients for the curry sauce. I get out my yellow curry paste. I got the recipe from Pinch of Yum. We also have coconut cream, coconut milk, garlic paste, ginger paste, toasted sesame oil and in the background, some chow mein noodles. I take out my medium Dutch oven and set all the above ingredients aside. I won’t start heating the curry sauce up until the tofu is done baking. Then I preheat the oven to 400 degrees Fahrenheit. Speaking of which, the tofu is finished draining so I take the block and cut it in half lengthwise, before cutting the rest of the tofu into equal sized cubes. 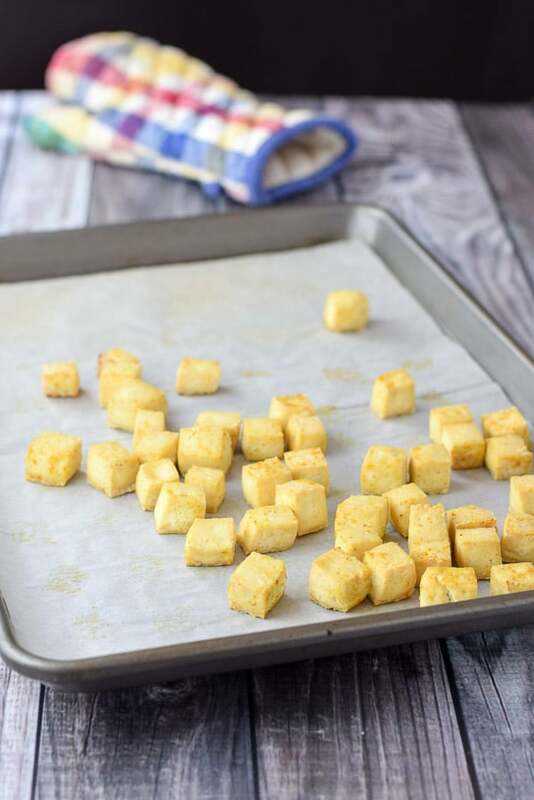 I toss the cubes in some curry powder and line them on a parchment paper lined jelly roll pan. I bake the tofu for 25 minutes. As it is baking, I put some water on to boil. They are crispy little critters! Woohoo. Time to heat the Dutch oven on medium. 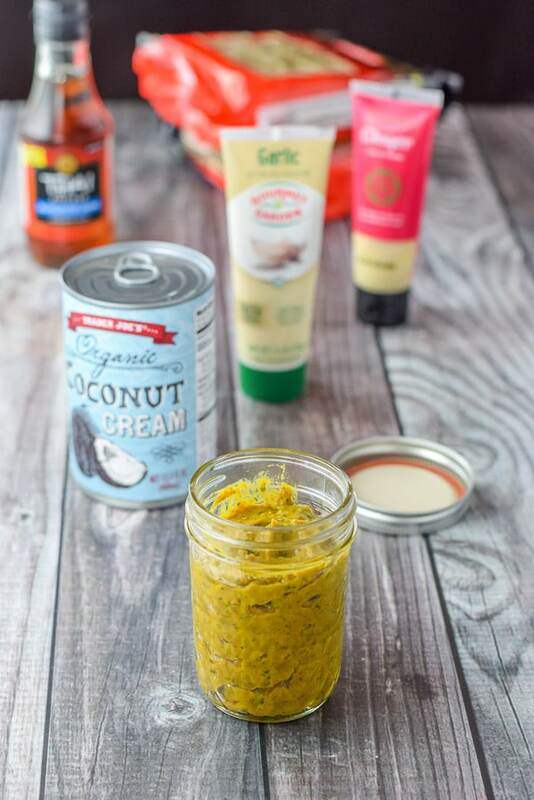 I put in the 3/4 cup curry paste, the whole can of coconut cream, 1/2 can coconut milk, 2 tablespoons fish sauce, 2 teaspoons garlic paste and 2 teaspoons ginger paste. I heat it all up until the coconut cream and milk melts and the aromas smell yummy. Once the water comes to a boil, I put the chow mein noodles in and set the timer for five minutes. When the five minutes is up, I run cold water over the noodles to stop them from cooking and drain them in a colander. I add the noodles to a serving bowl and pour the curry sauce on top. I add the crispy tofu and toss it all together. For garnish, I add some cilantro. Time to serve the tofu curry noodles! I used both packages of chow mein noodles, but if you want a saucier curry noodle, you can go with one package! We love curry noodle leftovers. So good! 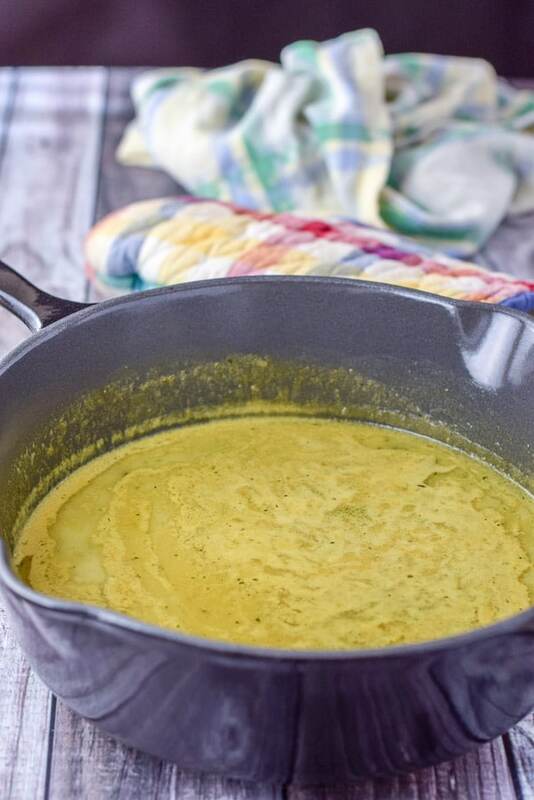 Why don’t you sign up to get my recipes in your inbox? You can also leave me a comment. What is your favorite type of curry? I’d love to know. 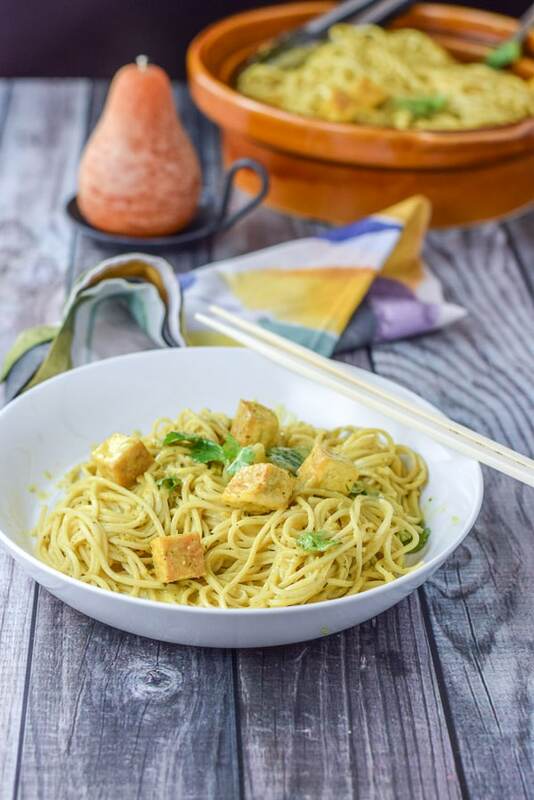 If you’ve tried this crispy tofu curry noodle or any other recipe on the blog, I’d love the hear what you thought about it in the comments below. I love hearing from you! You can also FOLLOW ME on FACEBOOK, TWITTER, INSTAGRAM and PINTEREST to see more of my delicious food and delightful cocktails! 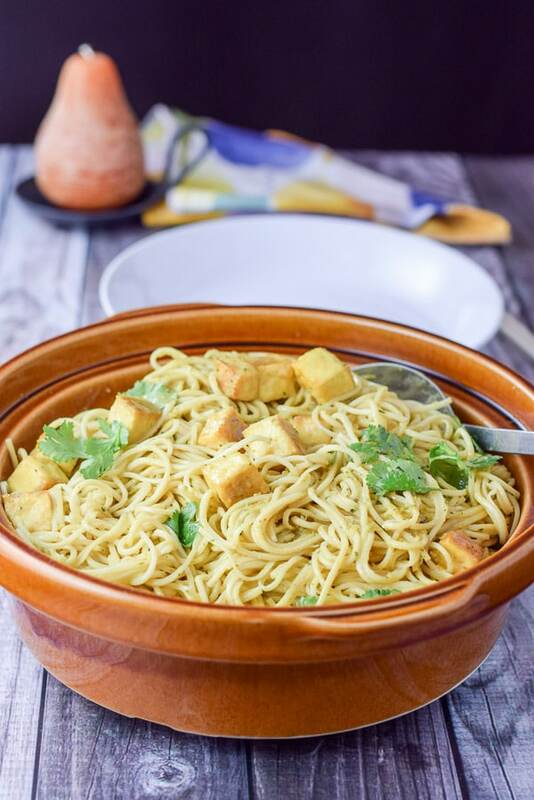 This flavorful crispy tofu curry noodle dish is easy and impressive!! If you like lots of sauce on your noodles, just use one package of chow mien noodles. You can also use any type of noodles for this dish, like rice noodles, etc. Me too Nicoletta! Soooo good! I know right? Thank you Christopher!